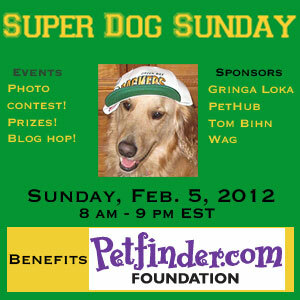 All Things Dog Blog All Things Dog Blog: Super Dog Sunday™ Sponsors: Meet our Petfinder Supporters! Dogtipper and I sure did pick a tough time to set up a charity event. We persevered through the holidays and vacation period. Luck came our way and we have four fab sponsors to show for our efforts. We're so excited to show them off! Allow me to introduce you to Petfinder Foundation's new best friends in Alpha order, just as it would be in the dog world. BOL! Gringa Loka is a new treat company, just getting on their feet and eager to give back already. Their adorable waffled treats appear to be a delight for our dogs and we're loving their willingness to work with us so generously. PetHub has their sites set on making it easier for lost pets to find their way home. While a tough goal indeed, they are making great strides, and winning awards along the way. We are proud to have them on our philanthropic team of brands who want to give Petfinder Foundation a little paw bump. Tom Bihn is relatively new to the pet world with a new introduction to their offering of well-made bags of all kinds. Their pet carryall for walks and dog park trips is a nice addition to their other products, made to last, with some truly great features. Wag is an online bank for dog lovers. Cool concept, huh? Watch for their profile review coming up to learn more about their plans and the concept. I love their tagline: "Enjoy a rich life with your pack." So, our sponsors for Super Dog Sunday™ are no longer a secret. The Tweets have begun to sing their praises, and everyone is busily preparing a photo op for Fido to enter in the NFL-themed photo contest. Even my little Oliver has a totally-cool costume. Too bad he can't win :( The prizes for this shindig have all been provided by our 4 sponsors, so watch for some great swag coming your way. Submission information is listed below the post. To help you out, there are options: enter your own dog's pic and/or enter a doctored up (aka themed) Petfinder pic. You can join our #SuperDogPics Twitter Party to learn more about how to theme your photo easily, get photo tips from pet photographer and Publisher of Life and Dog, Brett Chisholm, and win prizes too. Super Dog Sunday™ Photo Contest Rules: One photo per dog may be submitted. Each submission is to be either published by a blogger and linked up to the Blog Hop OR sent to EventBarkers@gmail.com. Event Barkers is the event planning partnership of Dogtipper and All Things Dog Blog. Email submissions must be sent by kick-off time on February 5 and may begin immediately. Please include your dog's name and your name. Only your dog's name will be published on the Blog Hop, purely as identification. In case of Internet disruption or Linky List downtime, Event Barkers has established a "Rain Date". Super Dog Sunday™ will open Monday, February 6, 2012 at 8 AM and close at midnight Tuesday, February 7. Mark you calendars just in case. Super Dog Sunday™ Blog Hop Participation: Bloggers may publish and link up their own entries via the linky list. We will provide code for Wordpress.com blogs in the opening post, so all bloggers should be able to participate. Linkups may continue from 8 AM until 9 PM. Non-bloggers may send their themed photos, with dog's name and owner's name to EventBarkers@gmail.com by kick-off time on February 5, 2012. They will be published by the Event Barkers team to appear in the Blog Hop/Photo Contest before its close at 9 PM. Winners will be announced on Monday, February 6, 2012. #SuperDogPics Participation: Everyone is welcome to participate in the photo-tips Twitter Party; however, to win prizes, you must RSVP at this link by the party start time of 3 PM, January 22, 2012. Please follow your hosts @AllThingsDog and @Dogtipper, and our guest expert @LifeandDog. Use the party hashtag of #SuperDogPics in every Tweet to identify yourself to other Twitter Party participants. In the case of Twitter downtime, Event Barkers has established a "Rain Date" of Monday, January 23, 2011 9 PM-10:30 PM EST. Full disclosure: Super Dog Sunday™ is a charity event. All proceeds go to the Petfinder Foundation. Prizes have been provided by the sponsors as a promotional courtesy. The #SuperDogPics Twitter Party is intended to support Super Dog Sunday™ by providing information and ideas for theming and photographing your pet's NFL-themed entry. Prizes have also been provided for this event as a promotional courtesy. Dogtipper and All Things Dog Blog have arranged these events purely to support the Petfinder Foundation and its rescue efforts. Cool sponsors. I don't have anything football themed because we are NCAA fanatics (go Ky Wildcats) but I always look forward to the fun with All Things Dog blog.